• Location: River Mile 428.0. • River Elevation: 528 Feet. • Railroad: Chicago & Northwestern Railroad. • Daily Traffic Count: 0 Trains Per Day (Abandoned). • Bridge Type: Steel Truss Through Deck w/Lift Span. 1,400 Foot Back Channel Bridge. • Navigation Channel Width: Unknown. • Height Above Water:: Unknown. The original bridge at this location was built by the Iowa Central in the 1880s. A new bridge was built in 1909 on new piers along side the old bridge. You can see the piers from the old bridge in the photo above. The new bridge consists of 9 truss sections, plus a 220 foot long vertical lift section, and a short truss section on the Illinois side. The Iowa Central was bought up by the Minneapolis & Saint Louis Railroad on January 1, 1912. The Minneapolis & Saint Louis was itself bought by the Chicago & Northwestern on November 1, 1960. The C&NW closed this rail line in 1971. On June 30, 1981, a group of youth decided that the bridge would make a good launching point for their private fireworks display. A shell entered the bridge tenders shack and exploded. That set the shack on fire, which then set the grease on the bridge mechanism on fire. The fire eventually caused the lift span to fail and drop into the Mississippi River. 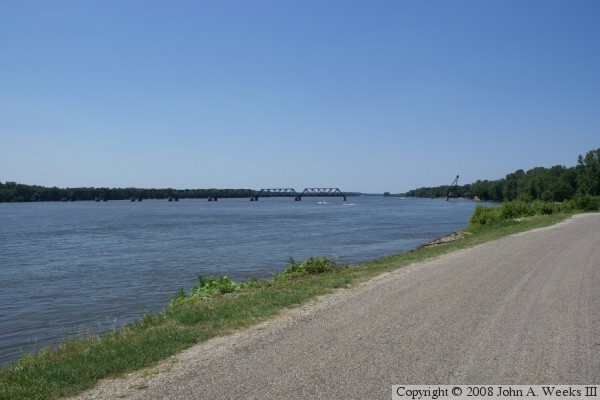 The accident blocked river traffic for several days until the US Army Corps of Engineers could remove the collapsed bridge section. Later, a second bridge section and the piers were removed to make a very wide navigation channel. The rest of the bridge survives some 25 years later. There is some track on the Iowa side. 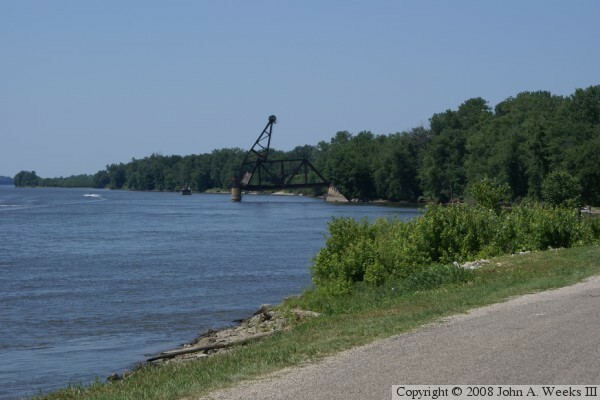 The track has been removed from the Illinois side, and the right of way has been removed in places to facilitate water flow in the back water areas. Keithsburg never was a big city, or a major port. 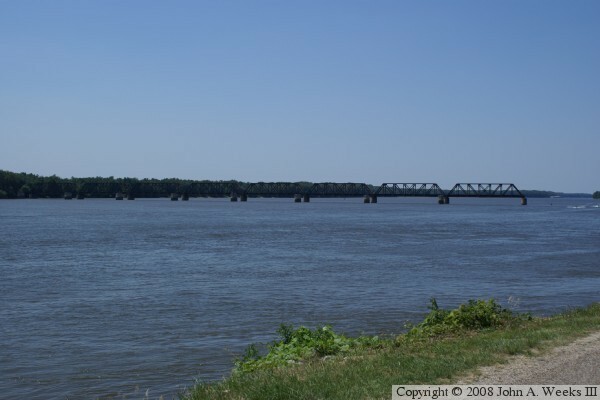 It was devastated in the 1993 Mississippi River flood. What was left has gone further downhill as the remaining industry did not rebuild or left town after the flood. There was a plan to revitalize the city in the mid-2000s, but that failed due to local opposition to a Hooters-style restaurant. There have been proposals to reuse the bridge. One scheme has hopper cars dumping grain into barges from the existing bridge structure. Another plan is to convert the bridge to highway traffic. That would be difficult at best given that this is a single track bridge.